. Yamanokami and Tengu 天狗 Mountain Goblin legends . Tengu no ki 天狗の木 or Yamanokami no oshimi ki 神のおしみ木, trees that Tengu and Yamanokami like very much. These trees must not be cut down. If someone tries to cut such a tree, he will hurt himself. If someone cuts a tree from Mount Tenguyama, there will be a fire in the village - this tale is well known in the village and not many people dare to go up there. the Shrine 下津留神社 Shimo-Tsuru Jinja. 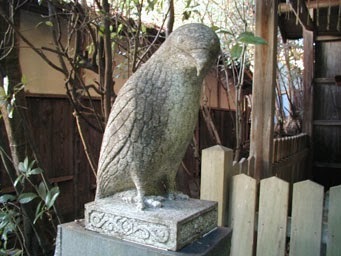 Until 1935, there is a new statue of a Tengu, venerated as Yamanokami. The shape of the mountain is said to look like a Tengu. Tsuru 津留 is a town in Kumamoto. misotsuki hi ミソつき日 /？味噌搗き making Miso paste. The 16th or 20th day of the first lunar month is the day where Yamanokami inspects the trees in the forest and forest workers take a rest. If someone goes to the forest, he will get hurt or have other misfortune. If someone tries to cut down a tree sacred to Yamanokami, the tree will twist and the ax can not be pulled out. In this case, there will be very bad weather soon. Around the village 平沢水 Hirasozu Yamanokami is also venerated as a deity to heal or prevent a cold. People make offerings of 赤土を団子　balls of red earth and pray. Sometimes the balls are wrapped in green bamboo leaves. If forest workers want to cut down trees they have to look out for a tree with the first branch facing North. This is Yamanokami no tomarigi 山の神の泊木 a tree sacred to Yamanokami and may never be cut. The 16th day of the New Year and the O-Bon festival in August are festival days for Yamanokami. In the morning people are not allowed to go into the forest. In the afternoon they might go, but if the smell of 味噌汁 miso soup comes into the nose of Yamanokami, this person will die within the year.
. misojiru 味噌汁 / みそじる miso soup .
. kijimunaa キジムナー Kijimuna . The Kijimuna is also called ブナガヤ Bunagaya. Someone went collecting firewood and saw it. Its hair is all red, and so is the face. It has the features of a child of four or five years. Some say it is Yamanokami and pray to it. At the top of the pass there is a small sanctuary for Yamanokami. 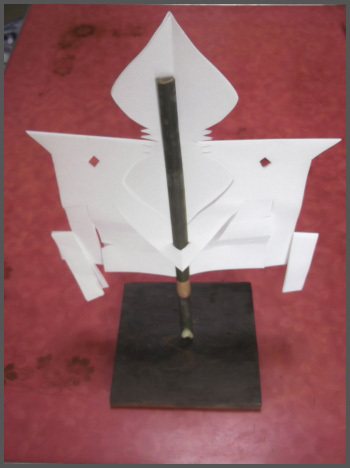 On the fourth day of the first lunar month, people make offerings of gohei 御幣 ritual paper wands. Above the oven for making charcoal is a ritual paper wand and Yamanokami is venerated here. - . misaki koojin ミサキ荒神 / misaki no koojin ミサキの荒神 .
. Okayama no Misaki Densetsu　岡山のミサキ伝説 Misaki Legends from Okayama .
. Sanbo Taro, Mitsuho Taro 三穂太郎 と伝説 - Nagi . A deity that dwells in the mountains. In Okayama, Yamanokami is not venerated as much as in the Kinki area. It is most probably a female deity but has changed appearance many time. 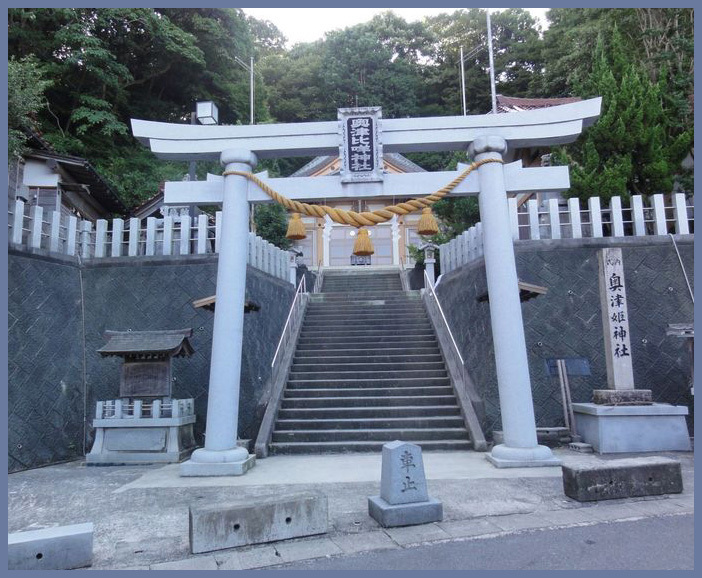 In Okayama, there are more shrines dedicated to Oyamatsumi no Mikoto. A protector deity of the temple at 頂見山 Chokenzan. Founded in 736 by 行基 Saint Gyoki. The 御神門 main gate has been relocated from the 大山祇神社 Oyamatsumi Jinja at 愛媛県大三島 Ehime, Omishima. On the 9th day of the first lunar month, villagers are not allowed to go to the mountain forest, because Yamanokami goes there to count the trees. If someone goes to the mountain, he will be counted as a tree and become one. Woodcutters and charcoal makers use this day to celebrate and feast.
. Koojin 荒神 Kojin, Aragami, "Wild Deity" . In the hamlet 西油野 Nishiyuno Aragami is seen as the Yamanokami. He often puts a curse on people. 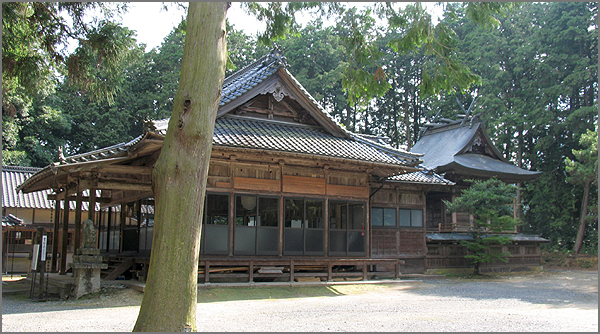 When the house of this family was constructed, someone had cut a tree sacred to Yamanokami and the family was thus cursed. To appease him a small sanctuary was built. A priest had told them the house had been cursed already before that so they build another sanctuary. In the 中国地方 Chugoku region there are various connections between Yamanokami and the huge serpent. In the village 備中都窪郡庄村 Shomura Yamanokami is called ヤマガミ Yamagami. His real appearance is said to be a huge serpent.
. Yamanokami no daija 山の神の大蛇 great serpent of Yamanokami . During the Shrine festival from the 13th to 15th day of the eleventh lunar month, in former times, there were two baby wolves born on the 14th day in the shrine. This is the beginning of their veneration. There is 小祠 a small Shrine in the North-Eastern corner of the innermost room of the building. People are not allowed to peek into this room, but may come and pray for protection from illness, disaster and other misfortunes. In the back of the compound is the Wolf Shrine 奥御前神社 Okugozen Jinja, often simply calld 狼様 Okami Sama.
. Yamainu 山犬 / 狼 Okami, Wolf .
. Kuraokami, Takaokami and Kuramitsuha . Hatsukunishirasu Sumeramikoto (御肇國天皇); was the tenth emperor of Japan.
. Legends from Okayama　岡山の民話と伝説 . The portable shrine is carried on a boat to the torii gate in the sea to meet the deity of Okutsuhime Shrine on Hegura Island. 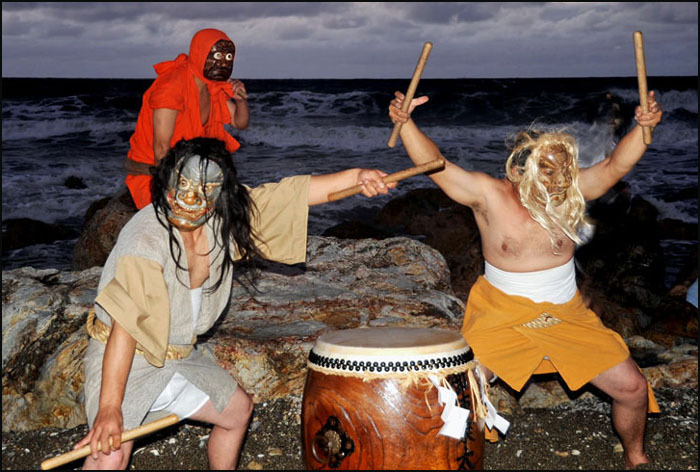 After the portable shrine returns to the beach, the performance of Gojinjo drums starts. 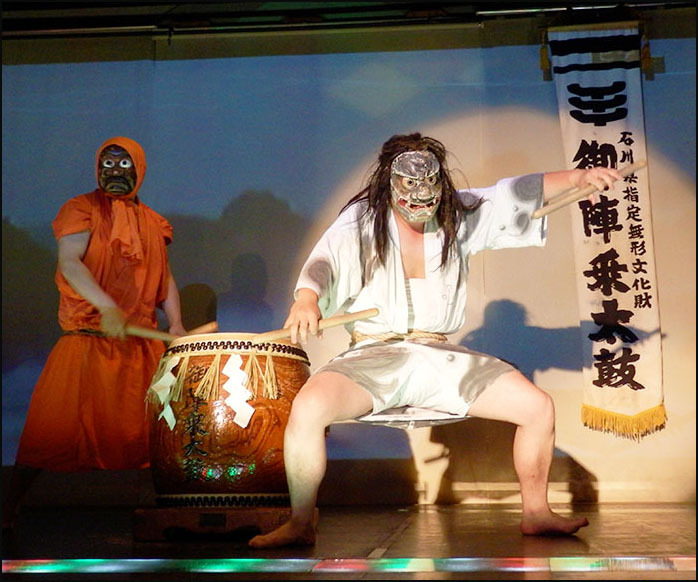 The fearful demon masks and dynamic sound of the drums are impressive. After 11 o’clock at night, the portable shrine and kiriko lanterns are paraded through the town, and a kiriko performance takes place in the square. In some regions, Juni Sama is seen as two deities, husband and wife. His / her messengers are Okoze, the stonefish and Okojo, a kind of weasel. 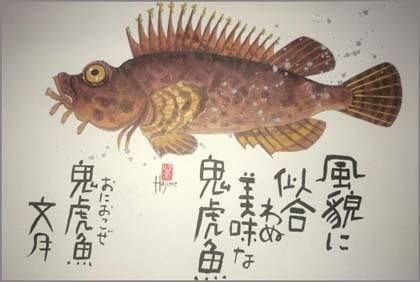 okoze 虎魚 / 鰧魚 / オコゼ stonefish and オコジョ Okojo weasel. with legends from Gunma and Nagano. 十二山の神 Juni Yamanokami, 十二山神 Juni Yamagami . . .
大山祇十二神社 Oyamazumi no Mikoto Juni Jinja . . . These deities are often venerated at 12 stone memorials or in 12 small shrines. 2 - A deity that has given birth and raised 12 children. 3 - A place where 12柱の神 12 deities are venerated. 4 - . 12 incarnations of Amida Nyorai - 十二光仏 / 十二光佛 Juni Kobutsu . 5 - . 12 zodiac animals 十二支 Juni Shi . 6 - . 12 Kumano Junisha Gongen Avatars from Kumano 熊野十二所権現 . 7 - . 12 Ten Deities, 12 Devas 十二天 Juni Ten, Jūniten . 8 - . 12 Heavenly Generals 十二神将 Juni Shinsho . Each of them represents one heavenly direction, one of the twelve hours of the day and one of the twelve months of a year. Yamanokami venerated as Juni Sama has given birth to 12 children in one year. He is venerated as a mountain deity that brings 山の豊穣 a rich mountain harvest. This began during the Oei Era (1349-1427), when a man called Suzuki Kuro came from Kishu and he enshrined deities the Juniso of his hometown Kumano. The name of the surrounding area is called Juniso. The Juniso Pond which was located at the west side of Kumano-jinja Shrine, was used as a reservoir for the town of Tsunowazu, and there is a legend that a woman drowned herself and became a giant serpent. There was a waterfall on the eastern side and it was popular as a scenic spot.
. Twelve Shrines at Tsunohazu in Yotsuya .
. 12 Kumano Junisha Gongen Avatars from Kumano 熊野十二所権現 . Juni Yamagami is seen as husband and wife. Near the hamlet is the shrine 山神神社 Yamagami Jinja. It houses two statues, a husband and wife. Once a woman felt very ill and had an itinerant shaman look at her problem. He told her she had peed on a spot where Juni Sama uses to pass by. He performed ablutions and soon the woman was healed. At the hut for the hunters it is customary to take water ablutions every morning before entering the forest and pray to Juni Sama. He is also called 十二大明神 Juni Daimyojin or 大山祇命 Oyamazumi no Mikoto. If someone dies in the mountains, his soul can be transferred to a weasel. At the foot of the mountain, Juni Sama and Fuchikari are venerated every morning and evening. Fuchikari gets special food offerings. There are quite a few legends about Juni Sama in Gunma. hitotsu manako ヒトツマナコ "one eye"
Juni Sama is a female deity who gave birth to 12 children in one year, one in every month. This is most probably the same as the deity called Hitotsu Manako, who comed to the village on the 30th day of the 11th lunar month. Dried Okoze fish is called okojo オコジョ. If it is offered to Juni Sama, the Weasel, there will be a good hunting season. But the offerings have to be made in the correct way. If they are placed with both hands, the hands might disappear with the offering. The Weasel often stays with one family and watches over their well-being. Once upon a time, the Wolf Deity had given birth in the shrine of Juni Sama. People then brought special rice offerings to celebrate.
. Yamanokami messenger, the inugami 犬神 Wolf Deity . 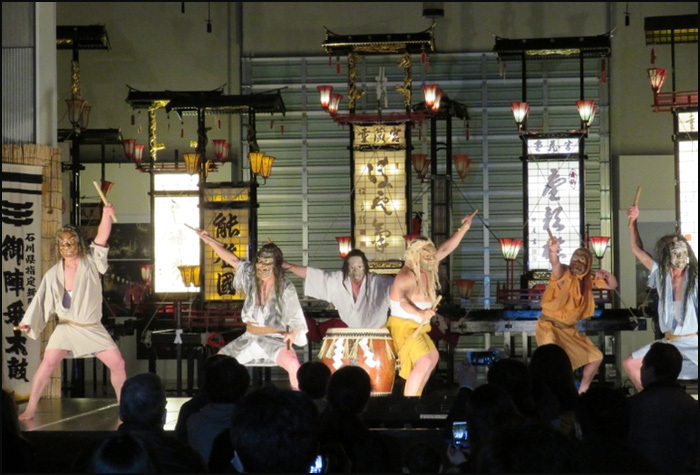 On the night of the tenth people prepare special mochi餅 ritual rice cakes and make offerings to the small shrines of 八幡様 Hachiman Sama, 十二様 Juni Sama, 道陸神 Dosojin, the Wayside Deities and O-Tengu sama, the local Tengu. O-Tengu Sama no Obi お天狗様の帯 Belt of the Tengu. They are placed on the roof of the small sanctuary, cut in 108 small stripes. In 三ノ倉 Sannokura they are called Tengu no Sawa Mochi 天狗のサワ餅. People either place them on the sanctuary and leave or they take home an offering that had been made by a person before them. This is called Tengu Sama no Omigoku 天狗様のオミゴク　Offering for the Tengu.
. tookanya 十日夜 night of the tenth . 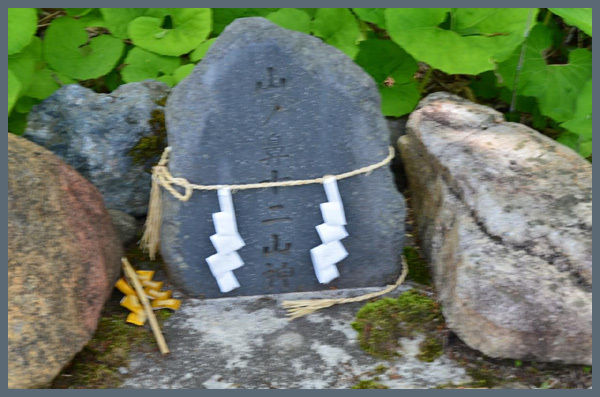 In Tone they make offerings to Juni Sama, because in former times a goze 瞽女 blind itinerant woman had been killed there and cursed the region.
. goze 女盲, ごぜ, ゴゼ, 瞽女 blind woman . inu kuguri 犬潜り - "a dog walks through it"
This is a plant / tree, which is not allowed to be cut down in the mountain forest. It has two stems and the branches become one as it grows. Yamainu ヤマイヌ the Mountain Dog, messenger of Juni Sama, walks through this. Trees with two-pronged roots sticking out on a mountain road or at a swamp are sacred to Juni Sama. Tengu also like to rest on them. So they are not to be cut down. The 注連縄 ritual Shimenawa rope is fastened around this tree, which is sacred to Juni Sama (Yamanokami) and thus not te be cut down. If someone cuts it, he will be crushed by 十二様の鳥居 the torii Gate of the Shrine for Juni Sama. In this region on the border to 上越国 Joetsu, Yamanokami is called "Juni Sama". The ubugami 産神 deity of birth is called Juns Sama in the hamlet of 藤野町名倉 Nagura in Fujino.
. juunikko ジュウニッコウ（十二講) Junikko . Juni Sama is a male mountain deity who protects women giving birth. He also helps with a good harvest. The 12th day of the second lunar month is dedicated to this deity, when he leaves the mountains to go to the fields as Tanokami. He comes back in Autumn after the harvest. Wheat bran (karako, カラコ, 麩) is offered to Yamanokami and then given to children to help them grow up healthy. 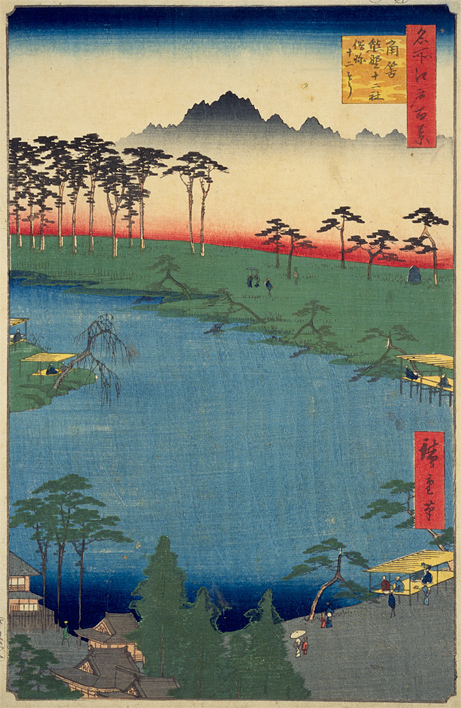 JuniSama descends to the fields in spring and comes back after the harvest. looked at the ears of wheat and lost one eye. So he is now known as 片目片足の神様 the Deity with one Eye and one Leg. Since then it is forbidden in the village to eat ニンニク garlic or 麦 wheat. Children born in the village of Joganji are often born with one eye much smaller than the other. The trees are about 26 m high. 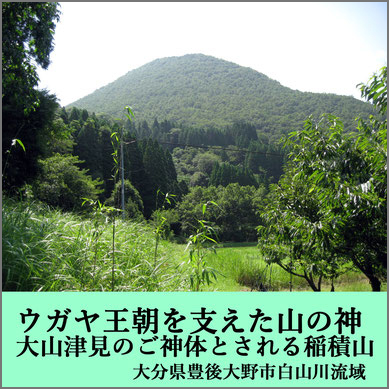 In 新庄市北部 the North of Shinjo is 不動山 Mount Fudoyama (546 m). 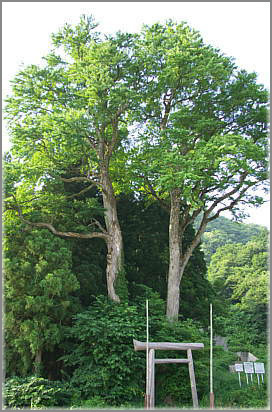 At the entrance of the shrine are two large Katsura trees. These two 門カツラ Katsura trees at the gate keep any Oni demons from entering the compound.
. 十二天様 Juni Ten Sama，十二天神 Juni Tenjin . 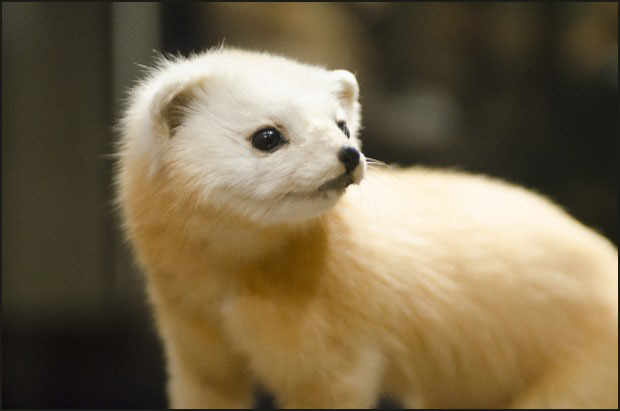 - - - Okojo is also the name of a short-tailed weasel, see below.
. Ta no Kami, Tanokami 田の神 God of the Rice Fields . Yama no Kami - Deity of the Mountains - is also living in other mountains of Japan. 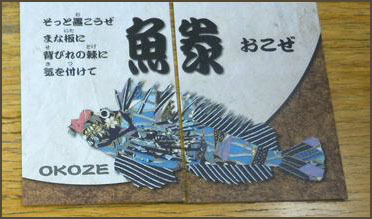 There are various traditions connected with the worship of this yama no kami, but the practice of offering an ocean fish called okoze is particularly widespread. Yamanokami, the Kami of the Mountain won. Since that event, Yamanokami likes Okoze.
. okoze 虎魚 (おこぜ, オコゼ ) stonefis, sting fish . 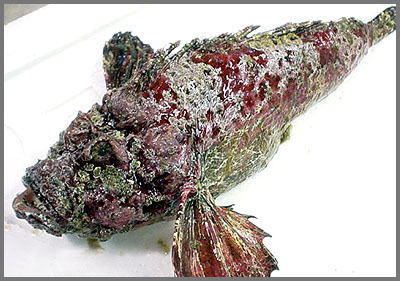 There are two species of 'stonefish', Synanceja verrucosa and Syanaceja horrida also known as the the reef stone or dornorn. Some legends about Okoze are related to giving birth and child rearing. - - - Okojo the name of a short-tailed weasel, stoat or ferret. As such Okojo is 山の神の使い the messenger of Yamanokami.
. kamadogami 竈神 God of the Hearth . 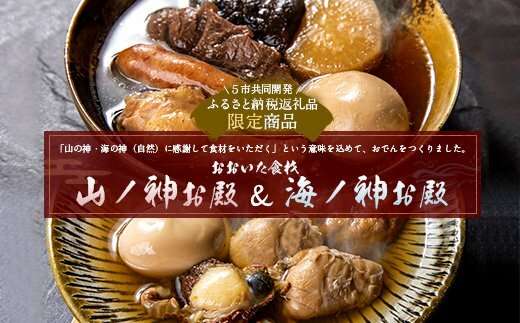 If people lost something in the mountain and do not remember where to look for it, they have to take some 鰧魚 Okoze and go back to the mountain. Once they found their lost item, they put the fish there as an offering. When lumberjacks go to the mountain to look for some especially fine lumber, they bring an offering of Okoze. This female deity likes オコジ Okoji （虎魚, okoze, stonefish). This deity also helps with giving birth and if a birth is difficult, people have to go to the mountain to call her down for help. But she dislikes 産火 fire used during birth. Family members where a birth has occurred are not allowed to go into the mountain for one week. Okoze does not like Yamanokami and does not want to be carried over the mountains. Yamanokami likes Okoze, but since the cats sometimes steal his fish, she dislikes cats. So lumberjacks are not allowed to talk about cats while at work in a mountain forest. "Dear Yamanokami, if you provide a good hunt for us, we will give you all this Okoze." Thus the greedy Yamanokami will grant their wish. A tree with two main stems is called Yamanokami no Hashigi 山の神のはしぎ "chopsticks of Yamanokami"
It is taboo to cut it town.
. Yama no Kami 山の神 God of the Mountain - Legends from Ehime . Eating Okoze after giving birth makes the mother milk flow in abundance. Yamanokami is a very ugly female deity. On days of no hunting people bring Okoze as an offering. They also pray that the Okoze offerings may be eaten by bears and thus keep them from attacking the hunters. Some carry one Okoze in their breast pocket and let the face hang out to be seen by Yamanokami. Dried Okoze fish is called okojo オコジョ. If people have to walk through the mountains, they bring an offering of Okojo. A hunter caught a weasel and cut its tail off. The animal did not die and he cut it three more times before it stopped moving. On that day, his wife got lost in the mountains and spent two days without food. If someone sees an Okojo weasel, there might a Yokai monster coming to visit him. He sometimes comes to help lumberjacks with their work. 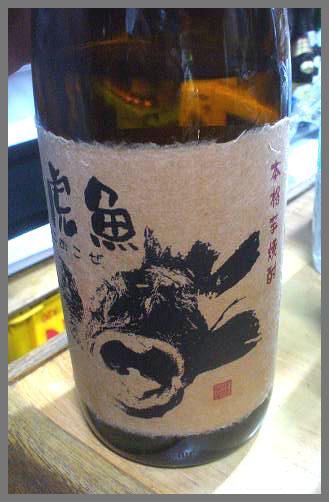 To thank him, they give him オコゼと酒 Okoze fish and Sake rice wine.
. Yama-Waro やまわろ / ヤマワロ / 山童 Child of the Mountain . the alter-ego of Kappa　河童 "Child of the River"
. imojoochuu 甘藷焼酎, 芋焼酎 Shochu Shnaps from sweet potatoes . If the Matagi bear hunters do not find an animal, the leader takes a piece of Okoze meat wrapped in white ritual paper out of his pocket and offers it to Yamanokami. And - oh wonder - they soon find their pray.
. matagi タギ professional bear hunters . 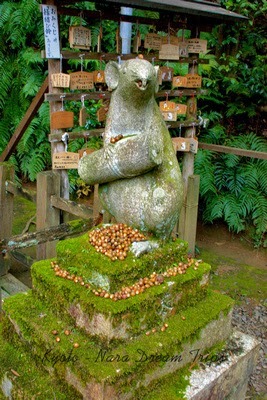 Okojo is 山の神の使い the messenger of Yamanokami. 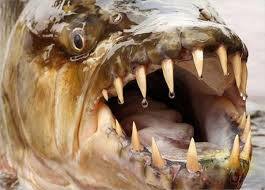 It lives near water and does not mind the presence of humans, but disliked dogs. As a Messenger of the deity it is not hunted. 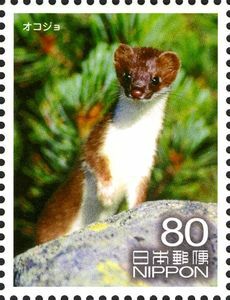 In 諏訪地方 the area of Suwa, if people see a weasel while on their way to the forest, this will bring bad luck and they go back home for this day. 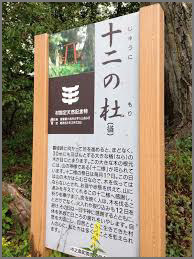 Once a hunter went up to 釜無山 Kamanashiyama, saw a weasel on the way but ignored it. Further on he was assaulted by a huge bear. Some villagers see the Tengu as Yamanokami and call him グヒンサン Guhin san. Others call him おこんぜ Okonze, O-Konze. 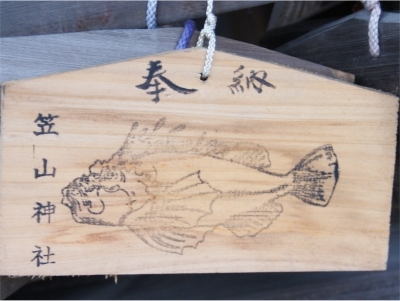 As an amulet to prevent fire disasters, the head of Okoze fish is hung at the entrance of the home. If stung by a bee or wasp, there are some spells to use, incorporating the Okoze fish. Being stung by an Okoze fish, people use the pubic hair of a woman, spread it on some rice with 糊 Nori seaweed and put it on the stings. After a birth if the mother does not have enough breast milk, some Okoze fish is put into Miso soup to drink. At the shrine 笠山神社 / 瘡山神社 Kasayama Jinja in Kitasoma village there is a legend about Yamanokami and Mizunokami. They compared the number of their kenzoku 眷属 followers and servants and found they both had the same number. But later by chance Okoze fish was found and the Kami of Water won. 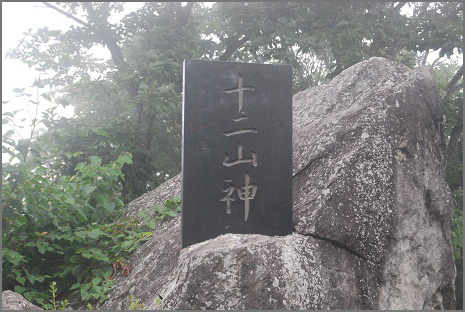 to make the Kami of the Mountain feel good, people bring offerings of votive tablets with an Okoze painting. If a cow gets lost in the mountain pasture, farmers bring an offer of Okoze fish to make sure they will find it eventually. Since Yamanokami likes Okoze fish, hunters bring an offering before they go into the mountain. This will ensure a bountiful hunting expedition. The 7th day of the 12th lunar month was the Day of Yamanokami. Since Yamanokami is on his way back to the stars for his winter rest, hunters offer the head of a really ugly-looking Okoze fish to stare at him on his way.
. Okitama, Futami Okitama Jinja 二見興玉神社 - Ise . Fudo and Kobo Daishi Pilgrims Temple - Umedera　梅寺 "Plum Blossom Temple"
. Ooyama Fudoo 大山の不動 Oyama Fudo Temple. Some words in Japanese use a honorific O　お　/　御　- but are not listed here. For example, Omikuji, O-mikuji is listed with the MMM entries.
. okoraago 御子良子 Okorago shrine maiden . - - - - - They live in special quarters (tachi 舘).
. okumiya 奥宮 "innermost shrine" Okumiya shrine, remote shrine, rear shrine, interior shrine .
. Omotesandoo Omotesandō 表参道 Omotesando main access road .
. Oni no nenbutsu, nembutsu　鬼の念仏 Demon saying Amida prayers .
. onsha, misha, gosha 御社 "venerable shrine" - mi-yashiro, on-yashiro .
. oshi　(onshi) 御師（おし/おんし） priest-guides of Oyama, Kanagawa .
. otabisho, o-tabisho 御旅所　/ お旅所 resting point .
. oyagami, sojin 祖神 "parent deity" - sorei 祖霊 ancestral spirits .
. oyashiro, koyashiro, shoosha 小社 small shrine . ... A long entrance path leads to the shrine. There are not so many visitors, mainly Japanese people who come to pray for health, long life and happiness. There is something unusual about this shrine that sets it apart from other shinto shrines. The guardians of the shrine are mice! 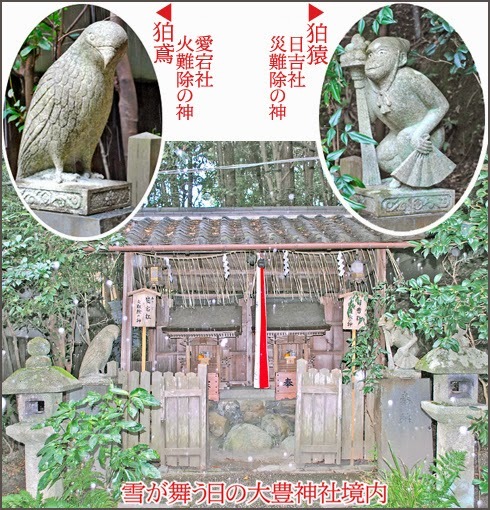 Here a little more about the history of this shrine taken from the web. Otoyo Shrine (大豊神社) is a small place of worship which is located on the South side of Kyoto’s Tetsugaku no Michi. 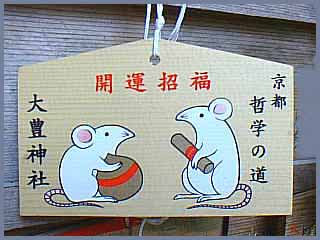 Here, instead of shrine dogs, mice guard the shrine. Why mice? 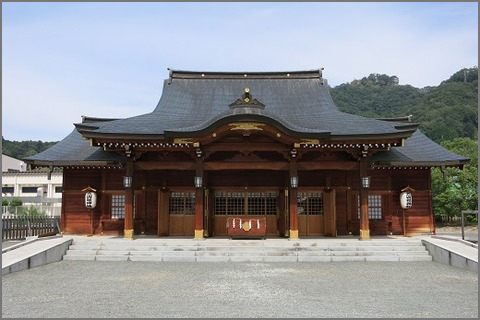 Here’s the background story: First, you need to know that in Otoyo Shrine, Okuninushi-no-mikoto, the god of marriage based in Izumo Taisha (a major shrine in Shimane Prefecture), is worshiped as a deity. He was a descendant of Susanoo-no-mikoto, one of the gods in Japanese myths. According to the Kojiki, which is the oldest historical book in Japan, Okuninushi went to another world. He arrived there and met Princess Suseri, daughter of Susanoo. They fell in love with each other at first sight. Then Susanoo commanded Okuninushi to sleep in a room filled with snakes, but Princess Suseri gave Okuninushi a snake scarf, said to be one of ten ancient treasures. The scarf helped him to sleep safely in the room. Susanoo imposed another ordeal on Okuninushi. Susanoo shot an arrow into a vast plain and made Okuninushi go to retrieve it. When he was searching for it, Susanoo set fire to the surrounding plain. The flames spread quickly and Okuninushi lost all means of escape. Suddenly a mouse appeared and told him that there was a hole in the ground. While he was hiding in the hole, the fire passed overhead. Then, the mouse gave him the arrow. Thanks to the mouse, Okuninushi escaped by a hair’s breadth. He finally married Princess Suseri. 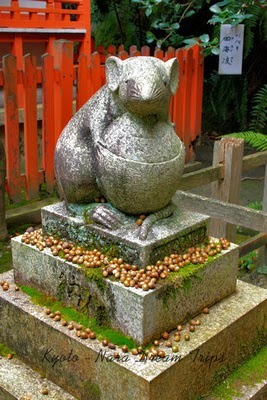 Otoyo Shrine traces its origins back to this story. It is said that mice will bring the health, long life and happiness. 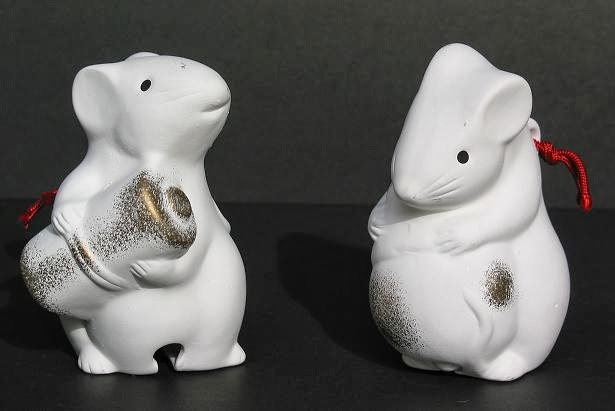 The mouse statue on the left has a sake bowl, which means that if you worship here you will have a healthy baby. The one on the right has a scroll. 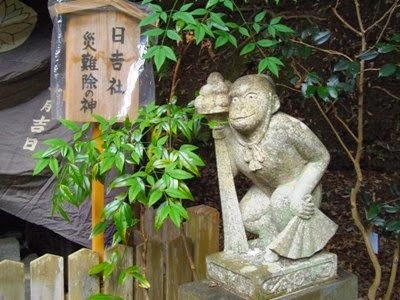 In addition to these statues, there are figures of a monkey and kite (hawk) in this shrine. You can enjoy observing these fascinating animal guardians. 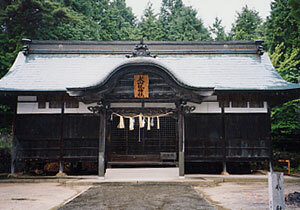 Enshrined at this shrine are Sukunahikona no Mikoto, Emperor Ojin and Sugawara no Michizane. Legend tells that this shrine was built in 887 as a prayer for the recovery of Emperor Uda from his illness. One mouse holds the scriptures, for the child to grow up in wisdom. In a rare occurrence, a cherry tree and a plum tree at a Shinto shrine in Japan's ancient capital of Kyoto are blossoming at the same time. The weeping cherry tree and the weeping plum tree are in front of the main hall of Otoyo Shrine　大豊神社　. 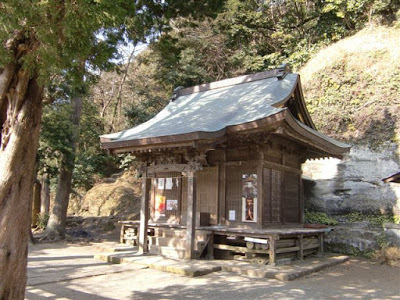 The shrine, which was built more than 1,100 years ago, is near a popular tourist site known as the "Philosopher's Path." The plum tree, which is estimated to be 250 years old, is about 5 meters tall. The cherry tree stands almost 8 meters tall. Every year, the plum tree is in full bloom around March 10th until the end of the month, while the cherry tree blossoms in early April. Temperatures were unusually high in March, causing the cherry tree to begin to blossom late last week. 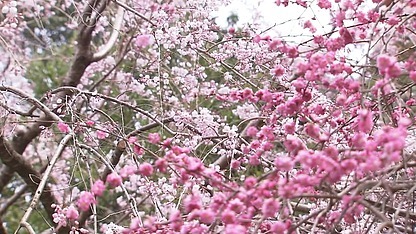 A shrine official says the cherry tree and the plum tree are blossoming together for the first time in 30 years. The blossoms are likely to remain until the end of this week.
. Shrine, Shinto Shrines (jinja　神社) - Introduction .